Kabirinejad, S., Kalbasi, M., Khoshgoftar Manesh, A., Hoodaji, M., Afyuni, M. (2014). The Relationship Between the Chemical Forms of Copper in the Soil Solid Phase Affected by Crop Residues With Phytoavailability of Copper in Soil. International Journal of Advanced Biological and Biomedical Research, 2(Issue 4 (2)), 21-30. Shahrzad Kabirinejad; Mahmod Kalbasi; Amir Hosein Khoshgoftar Manesh; Mehran Hoodaji; Majid Afyuni. "The Relationship Between the Chemical Forms of Copper in the Soil Solid Phase Affected by Crop Residues With Phytoavailability of Copper in Soil". 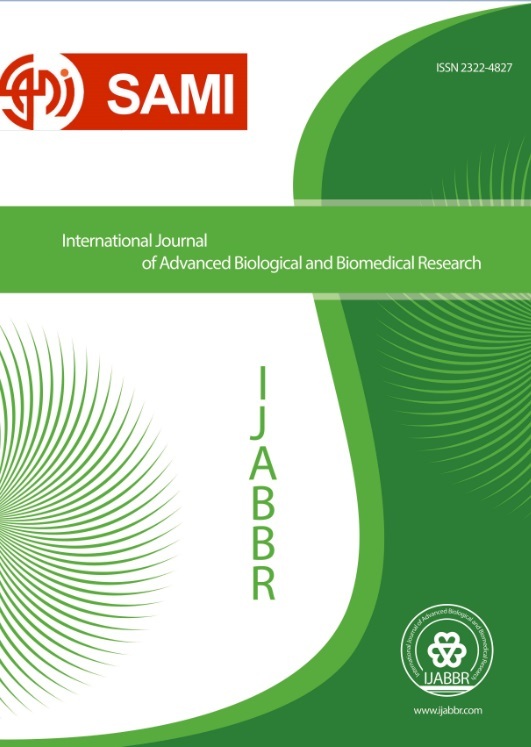 International Journal of Advanced Biological and Biomedical Research, 2, Issue 4 (2), 2014, 21-30. Kabirinejad, S., Kalbasi, M., Khoshgoftar Manesh, A., Hoodaji, M., Afyuni, M. (2014). 'The Relationship Between the Chemical Forms of Copper in the Soil Solid Phase Affected by Crop Residues With Phytoavailability of Copper in Soil', International Journal of Advanced Biological and Biomedical Research, 2(Issue 4 (2)), pp. 21-30. Kabirinejad, S., Kalbasi, M., Khoshgoftar Manesh, A., Hoodaji, M., Afyuni, M. The Relationship Between the Chemical Forms of Copper in the Soil Solid Phase Affected by Crop Residues With Phytoavailability of Copper in Soil. International Journal of Advanced Biological and Biomedical Research, 2014; 2(Issue 4 (2)): 21-30. Returning crop residues into the soil as a source of organic matter are an important source of copper and can play an important role in the soil fertility. In addition to the role of the organic matter in increasing the concentration of micronutrients in soil solution, attention should be also paid to the role of the kind and the quantity of the root’s exudates released in response to the incorporation of different crop residues in soil. Present research was conducted with the objective of studying the effect of the kind of crop residues : Trifolium (Trifolium pretense L) and Sorghum (Sorghum bicolor L), with control on chemical forms of copper in soil solid phase and relationship with bioavailable of copperin a complete randomized block field experiment, consisting of 3 replications and 3 treatments. After 30 days, increasing crop residues, soil samples collected and were used to measure Cu chemical forms in soil solid phase. Results showed that the crop residues significant increased the concentration of DTPA-extractable Cu. The highest effect was obtained for Trifolium treatment. Crop residues significantly decreased the concentration of soil Cu-Carbonate and the largest increase was observed for Trifolium treatment. Sorghum treatment significantly increased the concentration of soil Cu-Oxide in comparison with the control. Concentration of Cu-Organic both in Trifolium and Sorghum treatments increased as compared with the control. But the highest effect was obtained for Trifolium treatment. Cu-Oxide and Cu-Residual forms showed a significant negative correlation and Cu-Organic form showed a significant positive correlation with the concentration of DTPA-extractable Cu. Therefore, Trifolium residues application decreased the amount of soil Cu-Carbonate and soil Cu-Oxide forms (less soluble forms) and consequent increase of Cu-Organic which in turn elevated the concentration of DTPA- extractable Cu. Trifolium was the most effective in increasing the phytoavailability of Cu in soil.